Results: By grafting features analogous to those in Mother Nature's catalysts onto a synthetic catalyst, scientists at Pacific Northwest National Laboratory created a hydrogen production catalyst that is 40% faster than the unmodified catalyst. The team discovered that adding small molecules made from amino acids in the outer coordination sphere increased the speed without requiring additional energy to drive the catalyst. The outer coordination sphere is part of the catalyst's scaffolding. It creates channels used by electrons and protons to reach the heart of the catalyst, where the reaction occurs. 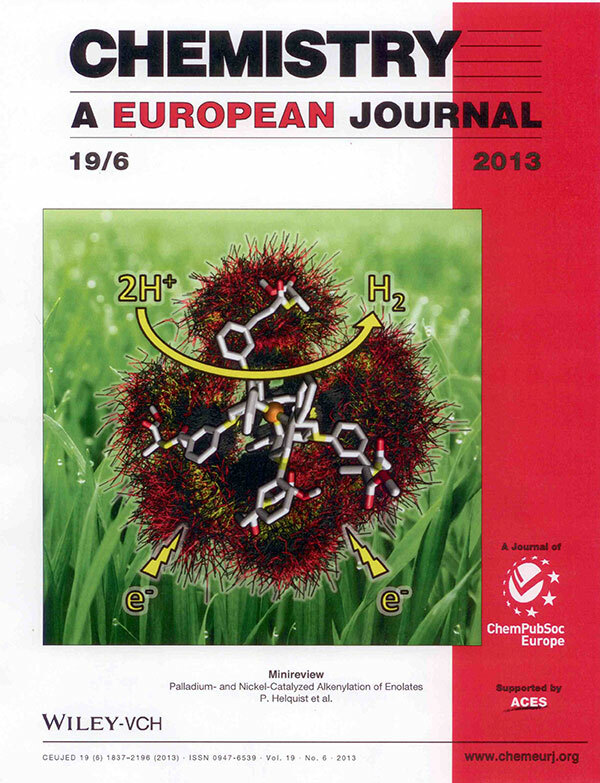 This study graces the cover of Chemistry: A European Journal. Why It Matters: Energy storage from wind farms. Long-lasting electric car batteries. Energy-rich, affordable fuels. All of these require never-before-seen fast, durable catalysts that are based on earth-abundant metals, like nickel and iron. This study provides foundational information that could, one day, help design and synthesize these catalysts. "To get the catalysts to achieve their full potential, we need to understand how to get them to overcome their limitations," said Dr. Wendy Shaw, a biophysical chemist at PNNL. Methods: The researchers were inspired by natural catalysts, such as the enzymes found in microbes and plants. Enzymes use nickel and iron, which do not have the same scarcity issues as platinum. Also, enzymes have a low overpotential, the amount of energy needed to start the catalyst and keep it going. The scientists want to design a synthetic catalyst that can reach enzymatic speeds, so they examined how they could add features from the outer sphere of enzymes to synthetic catalysts. "Using an enzymatic outer coordination sphere is not practical and probably not necessary," said Shaw. "We want only the essential features that we can use in real-world applications." The scientists took the well-characterized nickel-based catalyst for hydrogen production previously synthetized at PNNL and built a dozen different versions by adding either a single synthetic amino acid or a dipeptide, consisting of two molecules. Amino acids were added to the phenyl substituent present on the pendent amine in the second coordination sphere of the nickel center. Adding the amino acids to the catalyst allowed them to test the effect of different features, such as polarity, on the catalyst. Features such as an amide bond (carbon-nitrogen) increased the catalysts' speed, making them 40% faster than the unmodified catalyst, due to their ability to concentrate substrates close to the active site. However, some of the modifications also increased the overpotential. When the amino acid was added in the para position of the phenyl substituent, the overpotential was much higher than when it was added in the meta position. "We want to reduce the overpotential as much as possible," explained Dr. Simone Raugei, a PNNL theorist on the study. "The para addition made it faster, but the added features cost more energy. In the meta position, we got the same overpotential [as the unmodified catalyst] and faster production of hydrogen." Computational studies by the team's theoreticians showed that the dipeptide in the meta position was more compact, making electron transfer faster, because of the smaller energy associated with the necessary twist in the scaffolding, or the ability to get closer to the electrode. What's Next? The scientists are creating outer spheres that channel the necessary electrons and protons in a controlled manner to the catalyst's active site, increasing the catalyst's speed. Their research is underlying designing a material that can pump out hydrogen at rates and energy cost (overpotential) useful in fuel production and other real-world applications. Sponsors: This work was funded by DOE's Basic Energy Sciences, Physical Bioscience program; DOE's Basic Energy Sciences, Chemical Sciences, Geosciences, and Biosciences Division; the Office of Science Early Career Research Program through DOE's Basic Energy Sciences, and the Center for Molecular Electrocatalysis, an Energy Frontier Research Center funded by the DOE, Office of Science, Office of Basic Energy Sciences. What is the outer coordination sphere? A scaffolding of atoms set on the far reaches of a metal-based enzyme, the outer coordination sphere has a crucial role in the enzyme's activity. The scaffolding contains passageways or channels to and from the active site. Electrons and other needed materials transverse this channel. The scaffolding also works in stabilizing the overall structure and influences its electronic properties. Refining the scaffolding in synthetic catalysts could increase the catalyst's speed and efficiency. Different types of molecules have all been implicated in tuning the enzyme.